OMAHA, Neb. 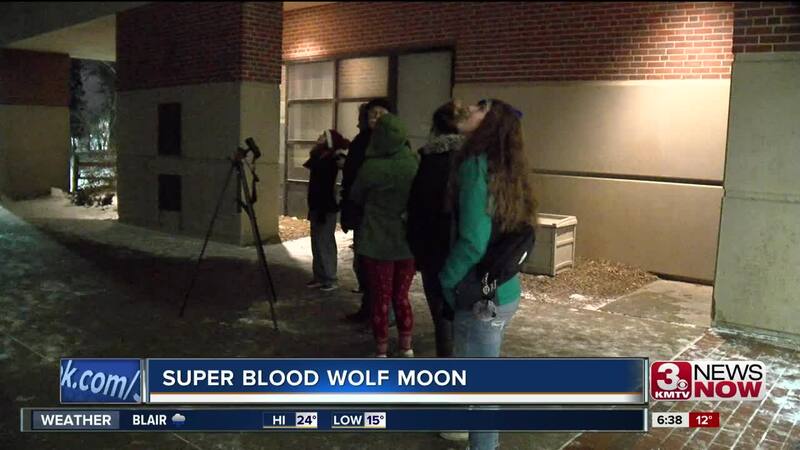 (KMTV) — The Super Blood Wolf Moon garnered lots of attention from astronomers and sky watchers across the world Sunday night. During the spectacle, a total lunar eclipse happened at the same time as a supermoon. The moon turned orangish red in many parts of the world. In Omaha, the clouds covered up much of the show. But, that didn't keep a number of people from showing up at the University of Nebraska-Omaha's Planetarium for the rare event. "It's always fun to see one, it's just an awesome sight to see the moon move into the earth's shadow and then it usually turns a deep orange red color of course that's where you got all this blood moon nomenclature that came up in the news media," John Johnson, Astronomy education outreach coordinator said. The next super blood wolf moon will happen sometime in 2021.